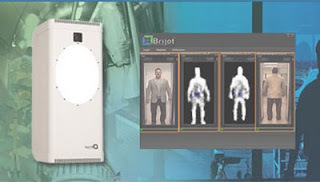 The one-month testing of new body scanner which is called GEN2 at Suvarnabhumi Airport, was started on Monday by AOT, The Airports of Thailand. It is built by Brijot Imaging Systems Inc of Florida, United States, and is imported by Law Enforcement Technology Solutions Co Ltd. This GEN2 uses millimeter wave radiometer, integral full-motion video camera, on-board computer and sophisticated software algorithms, including the industry’s first value-added detection engine, to identify the potential dangerous items or hidden items in real-time basic, according to manufacturer. Each unit cost 3.5 millions in Thai Baht. Imaging capabilities: Metals, plastics, ceramics, composites, glass, liquids, gels, explosives, weapons, currency, tobacco goods, wood and other materials - including those materials commonly used to construct weapons and explosive devices. Minimum object size: Imaged pixel size: Approximately 5 cm x 5 cm (2 in x 2 in). Detection engine optimization: Approximately 7.6 cm x 12 cm (3.0 in x 5.0 in). Large object detection: Program system’s detection engine to treat identification of large objects differently. Use system’s alarm utility to configure and trigger specific actions upon detection. Simultaneous processing: Detection engine processes multiple simultaneous detections. GUI displays up to 3 detection or “Large Object” icons at a time and features a contiguous running event log. Fully-integrated on-board computer: Pentium®-based processor enables stand-alone operation without external PC connection. Microsoft Windows XP™ Operating System integrates with local area networks for remote viewing and control via GEN 2 Application Software and APIs. Anti-tamper software: Applications actively prevent, detect and react to tampering and reverse engineering. Imaging speed: MMW radiometer 4 to 12 frames per second (FPS); CCTV 30 FPS. A corresponding tri-colored box also appears on the “Detection Status” area of the GUI with “D1,” “D2 “or “L” detection status icons. No Comment to " Body Scanner - GEN 2 "